Sign of a successful series: When the author dies and someone picks up the torch to continue the story-world the author created. That’s what has happened with Tony Hillerman’s wonderful Navajo Tribal Police mysteries featuring Lieutenant Joe Leaphorn and his protégé Jim Chee. Hillerman died in 2008; now his daughter brings us the first volume in a revival of this series. It focuses on Bernadette Manuelito, a fellow cop who appeared intermittently in earlier volumes and ended up marrying Jim Chee. The story opens with a bang—literally—as Bernie witnesses an attempted homicide. To say much more about the plot would give away its big surprise. Even the book’s jacket blurb and promotional materials are purposefully vague to avoid spoilers. Suffice it to say that Bernie gets involved in an important investigation even while being removed from the case because the victim is someone close to her. Chee, conversely, gets assigned the lead on the case although the victim is even closer to him. Bit of a head scratcher, that. The case arises from an old one of Joe Leaphorn’s, who is unavailable in this book so can’t help his colleagues. It involves ancient Indian pottery and Navajo rugs. As usual, readers learn a lot about Native American lore as well as Arizona/New Mexico geography as part of the mystery. Ms. Hillerman continues showing how important the environment is to her characters’ formation and lives. The threads of this crime are long and knotted, involving many characters across occupations and cultures. They bridge Hillerman-father’s world with Hillerman-daughter’s world. It’s surely not fair to compare the two as writers, but impossible not to do so for readers familiar with the original works. Ms. Hillerman’s style is businesslike, presenting facts—actions—characters—scenery without excess. Sometimes it’s too flat, sounding more like a report than compelling fiction. While Bernie is a well-developed character, those surrounding her, especially Chee, feel like background against which Bernie shines. One needs to read Hillerman-father’s books to plumb the depths of established characters. In this book, however, we learn more details about Lieutenant Leaphorn’s life than the previous volumes combined. Definitely not compelling, unless you’re a foodie; and little relevance to the story. As far as the crime is concerned, the characters are slow to recognize links that readers may pounce upon as key leads to pursue. Eventually Bernie and Chee reach the right conclusions, in time to avoid getting killed. It’s a near thing, though, forcing readers to sit on the edge of their chairs in suspense. 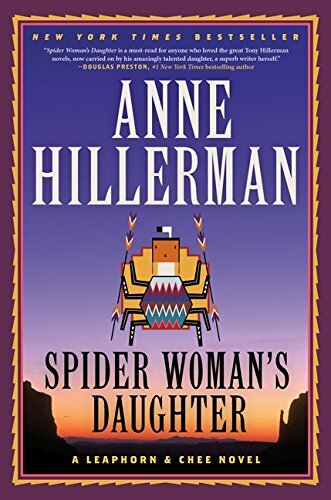 And thus Spider Woman’s Daughter continues the Hillerman tradition, providing likable heroes against despicable villains coming together in unusual and intriguing situations in a glorious, little-understood world. Worth trying for both old and new readers to create a fresh audience for the next generation of this series.